I'm a total newbie at Wordpress and almost gave up at trying to figure it out how to present my application but I have been able to navigate this theme easily. The theme worked great. Received files and everything shortly after purchase and seller was very helpful with any questions I had. A good price and easy to edit! So far so good. New at all this web stuff. Glad it came with a instruction to install - still trying to figure out what some things mean. But it appears I’m getting it done! Landing page-style & big impression. Carousel within frame & neat intro. Choose a single item to buy or pay once & upgrade to the Products Bundle to access all our WordPress themes & plugins for less than the price of two. Support is our primary focus; we understand that you are not a developer & we aim to deliver answers & solutions to your questions as quickly & efficiently as possible. All required assets are loaded asynchronously & on demand, meaning they are packed in parallel if & only your site needs. This leads to superior performance & is great for SEO. Our well-written & comprehensive documentation will give you an overview of the theme's main features & how they can be customized to suit your requirements. Get mobile friendly; Restarter theme is fully responsive out of the box, no need to create anything separate for your user’s mobile experience. Footer logo feature allows site owners to upload an image for their site which can be placed at the bottom of their website. Easily swap the content area & the sidebar layout from left to right or vice versa. This control gives you the option to lock the entire navigation to the top of the page as the user scrolls. Toggle search form in site navigation that makes users search the site quickly. 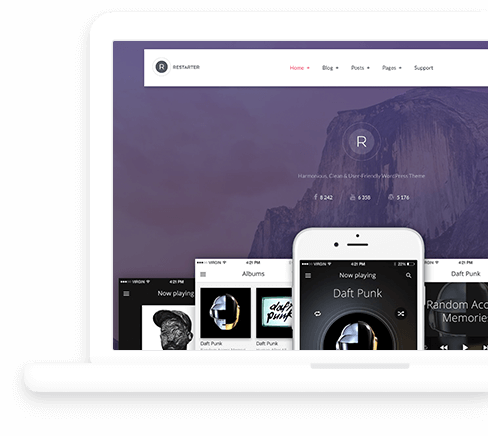 Optionally remove the Restarter credit & add your own custom copyright message, including HTML. Embed YouTube or Vimeo videos on a call to action box using a popup lightbox overlay display. Indicate a big box for calling extra attention to some particular content or information & put nearly any valid HTML. You can update the plugin automatically via the WordPress admin panel providing you have activated a valid license key. Create highly responsive carousels within frames with touch & swipe gesture support. A CTA is an ideal way to convert more of your passive website visitors into active leads & customers. Toggle the visibility & reorder the homepage components or any function hooked by Restarter theme or Restarter Plus plugin. A clean & easy-to-use testimonials management system to load in what your customers are saying about your business. Clean & easy-to-use features showcase management system to load in your product, company or services offers & display them on your website. The download buttons repeater allows you to create a set of sub-buttons which can be repeated while editing content. Create a lightweight, responsive image gallery carousel within frames to showcase & highlight your application's screenshots. Show off your application screenshots, & experience to prospective clients with providing split gallery & content block. An efficient way of displaying the difference between a small number of products & give visitors a way to buy their chosen one promptly. Display partners, clients or sponsor’s logos on your site quickly & easily, each brand can be named, linked & assigned with an image. Navigation social media links to services like Twitter & Facebook, allowing visitors to access your social profiles quickly. Create a fluid template which spans from right to left takes 100% of the screen's width. The blurb component is a simple & elegant combination of text and font icon which is a great way to showcase small bits of information. A simple yet useful feature to generate locational Schema.org compatible breadcrumb trails for posts & pages. Both plugin and theme are translation-ready and localized using the GNU framework. Easy-to-use team profile management system for the theme. Load in your team members & display their profiles on the front end. A single image. The first <img/> tag in the post content or uploaded featured image will be considered as an image post format. A single video or video playlist. The first <video/> tag or embed in the post content will be considered as a video post format. A quotation. The theme would add blockquote tag to the quote content automatically if the user didn't add it. A gallery of images. The theme will display generated gallery shortcode images as a touch-enabled carousel slider on the front end. 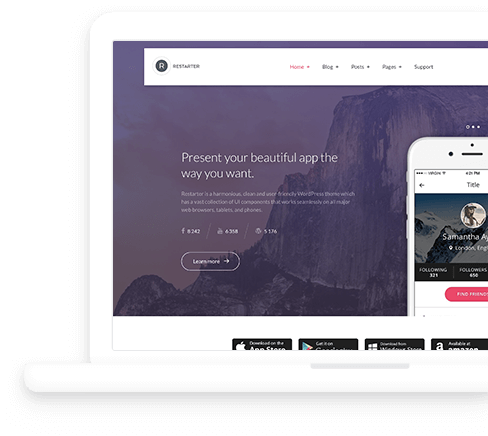 The free version of the Restarter theme gives you the perfect opportunity to try out the theme and design to see if it is the right choice for you before upgrading to the paid version. Feel free to contact us if you still have any pre-sale questions. Is this a plugin or theme? Restarter Plus is a WordPress plugin that extends the Restarter theme. How do I install and use the plugin? Simply follow the steps under Installation and First Steps provided in the theme documentation. Are your plugins a one time fee, or a monthly subscription? Currently, our products are a one time purchase. How do I download the files after purchase? Once your payment is complete, you’ll receive an order confirmation email with download link. This usually happens within minutes. We provide lifetime unlimited theme & plugin support to all our customers and users. There is no additional cost. Your website will remain intact even if you choose not to purchase a license for another year. You just won't get updates any longer. Will I receive future theme or plugin updates? You can update our paid plugins automatically via the admin panel providing you have activated a valid license key. 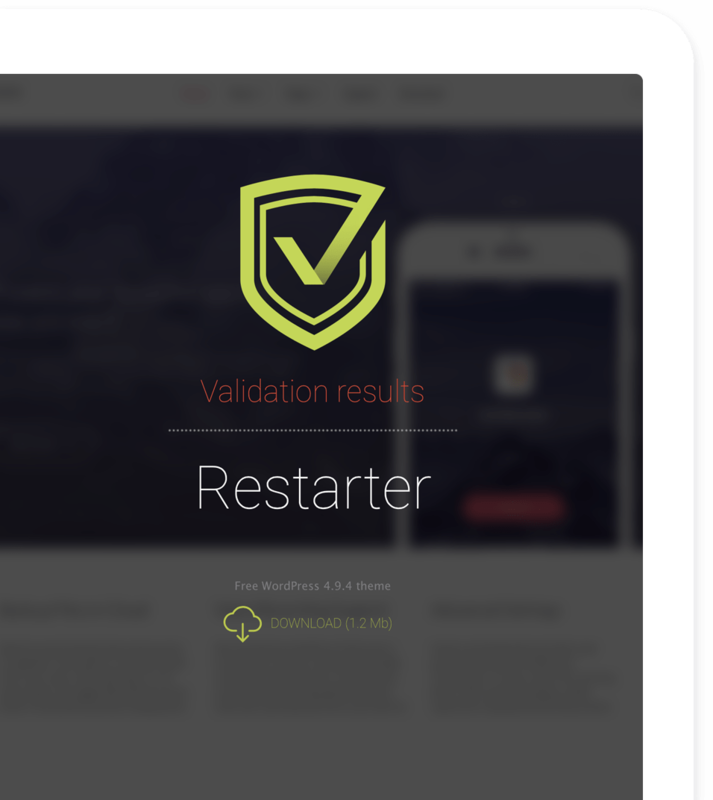 All versions, files, & folders of Restarter theme analyzed by ThemeCheck.org which is a site that provides a validation service for WordPress themes with running tests to verify security and code quality. 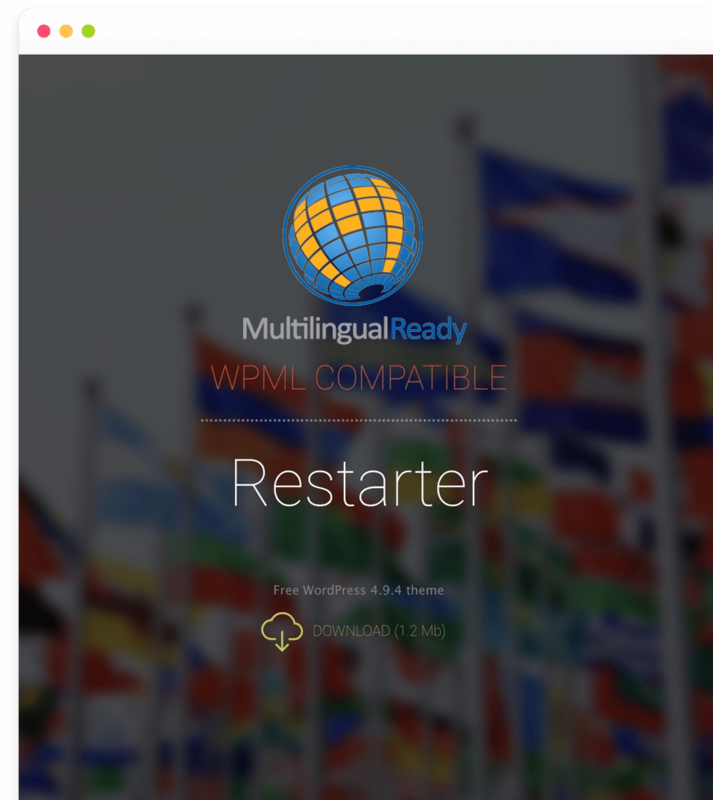 Restarter theme provides multilanguage support out of the box, & it is entirely compatible with most popular WordPress plugin (WPML) that supports the creation of multilingual layouts & pages.